From the day we are born till the day we die, stories have a significant impact our lives. No matter where you go, you probably can’t escape stories. They color everything we do, and there’s a reason why. They provide a medium for us to communicate and to understand the world we live in. They make us laugh, they make us cry, they give us hope. I was read to since I was a baby, so stories have been in my life for as long as I can remember. I started off my career as a fangirl when I was just three years old, listening to The Lion, the Witch and the Wardrobe on cassette tape. My love for stories began at such a young age, and I’ve heard similar stories about others who started young, too. I think a lot of our fangirlness is founded in the very beginning of our lives. So that’s why, today, I want to talk about the little fans. Often we don’t think of little kids as fans. After all, they’ve barely even scratched the surface of the world’s possibilities. But they are watching and soaking up everything--including the books, TV shows, and movies they’re exposed to. For me, what I was exposed to when I was young--which includes Star Trek: The Next Generation and 60s music--has stuck with me for my entire life. This fact is important--vital, even--because we have a huge responsibility to pass on what we love to those who are younger than us. I personally enjoy doing this with one little fan in particular. There’s a kid that my family babysits who is a huge superhero fan. Sometimes we talk about Captain America or just being a superhero in general (sometimes we act like superheroes, too). His opinion on superheroes greatly mirrors my own. Yesterday I put on my Marvel t-shirt, thinking nothing of it. In the middle of the day, Little Fan suddenly gasped and said “Spider-man!” He came over and I told him who each hero was. His favorite on my shirt was “the big green guy” (the Hulk) and Spider-man. My urge to pass on my fandoms doesn’t just stop at Little Fan, and it can get slightly uncontrollable at times. I once saw a little girl in public wearing an Iron Man shirt. I wanted to hug her and tell her to never let the world dim her enthusiasm, especially the people who say she can’t love superheroes because she’s a girl. Every time I see someone wearing a Star Wars t-shirt, or a Marvel t-shirt, or anything else fandom-related, I want to give them a huge hug and tell them to never change. Yes. Like this. Thank you, Dean. Even my own family isn’t safe. I’ve taken my twelve-year-old sister through the ins and outs of fandoms. We watch Once Upon a Time together and discuss Marvel headcanons and theories (and cry about Steve Rogers). She knows what shipping is, she fangirls, and she’s well on her way to a life filled with nerdiness. As she gets older, I plan to introduce her to even more of my favorite stories. Though I know it can be hard, I think it’s incredibly important that we are open with others about our enthusiasm for things. Wearing our heart on our sleeves helps us bring others into the joy of what we love so deeply. It’s difficult and scary, especially in a world that frowns upon fangirling, but it is so, so important. Especially when the next generation of fandom is watching. For me, there is no better reason to pass on the love of stories than that. To put it simply, fellow fans, we have a job to do. The next generation of fans is here. They’re being born, going to school, and growing up. They’re going to need a book or a TV show or a video game to help them through life. They’re going to need the community of the fandom. They’re going to need that one particular character or that one particular line that will reach right into their soul. They’re going to need to know that they are not alone. Agents, it’s our job to bring them into the fandom. Who’s with me? What little fans do you have in your life? 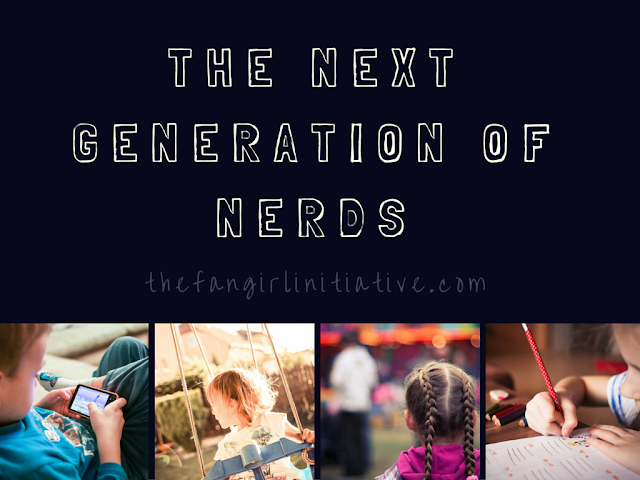 *joins the mission to convert all little kids into fangirls/fanboys* I never thought of it this way, but it is really important to show kids that it's okay and TOTALLY AWESOME to be a fan, and that they need never be ashamed to be one. Oh oh oh! I have a child sister! I VOLUNTEER HER AS TRIBUTE! I'm going to get her hooked onto Star Trek. I will report back upon our awesome fan-ness as it unfolds. But, you're right. We have a responsibility to share our feels with everyone, peer, young, or old.